More photos below (hover over each image for a description). 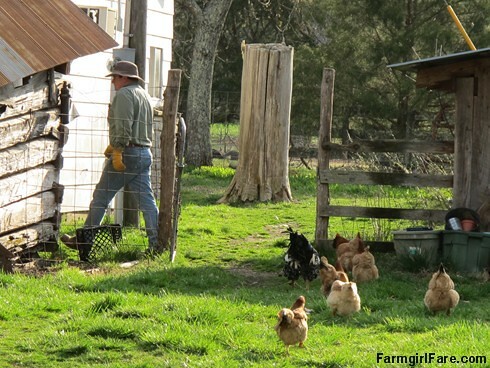 . .
© FarmgirlFare.com, where birds of a feather look cute (and flock) together. Isn't awfully low for nesting boxes? Do you have fox or anything else around that hunt chickens? Maybe your dog is just that good!! 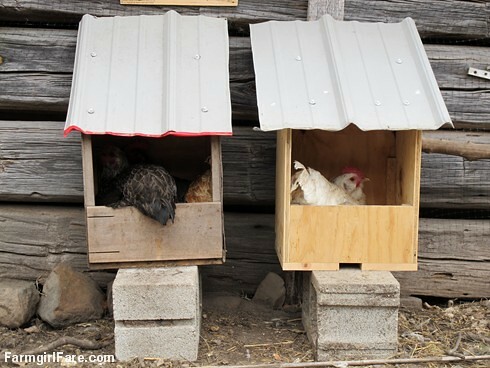 The height nesting boxes depends on your coop situation and the kind of boxes you make/buy. In our other two chicken coops, the nesting boxes are indoors and attached to the wall, a few feet off the ground. We've also used plastic milk crates lined with hay sitting on the ground. These hens are in our newest chicken area, which is a large open pen with one side made from a wall of the old log cat cabin (the nesting boxes are sitting up against it). The open area is fenced in with hog panels and then there is 7 foot high deer netting (which we happened to have laying around) attached to the panels, so the sides are really high. Nobody can get in, and nobody can get out. :) It's open to the sky, but covered partly by an overhanging tree, and between Bear and Bert (who mostly stay up near the house/farmyard where the coop is) and Daisy and Marta, our awesome livestock guardian dogs, we have only lost (knock on wood) one chicken to a predator in the last several years - and that was from this pen before we made it more secure. For a while last summer we had a few dozen chickens living and sleeping out loose in the farmyard (which was a big messy pain) and they all survived just fine. The big dogs even scare away hawks and other birds. They're amazing. On one side there is a low portable coop that Joe built, which is (I think) about 4' x 6' and opens from the top. That's where the hens sleep at night on a perch, but there isn't really enough space inside for nesting boxes, and it's kind of a pain to open the heavy lid to get eggs out of there every day. We already had that small nesting box on the left Joe had made a while ago, and it was getting overcrowded for 6 hens, so Joe built them a second one last week. So far they're working out great. I'm not sure if I ever posted a photo of this new chicken pen setup; if not I'll try and take some pictures. We really like it. 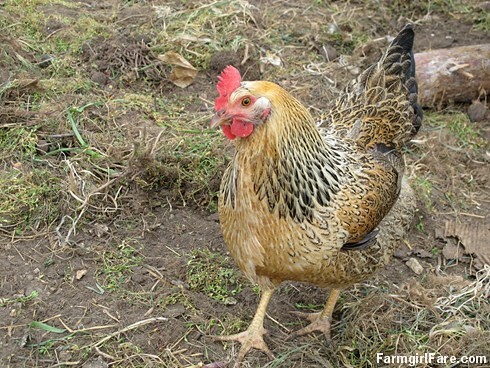 As for the height of nesting boxes, while chickens like to roost off the ground, being on ground level is actually what chickens are naturally used to when laying eggs, because if they're going to hatch out a nest of baby chicks, it's going to be on the ground. 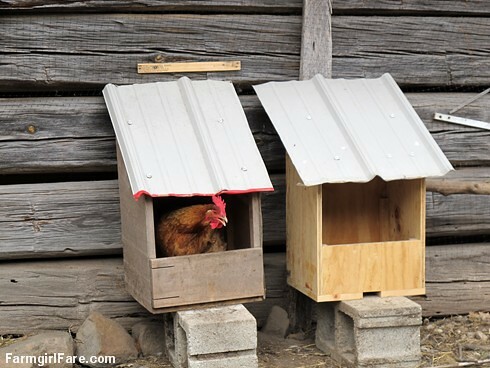 Putting the nesting boxes off the ground may give you some protection from predators, but it won't really matter if the chickens are already in a secure coop. 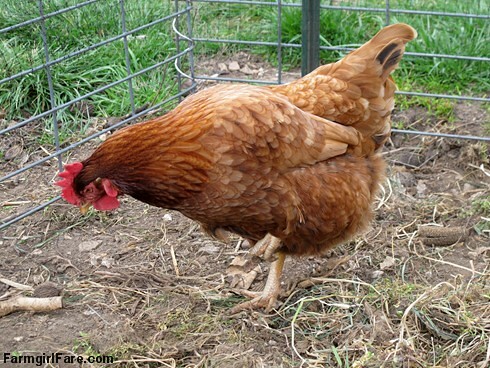 The most important thing is that the hens need a place to lay their eggs where they feel safe. The roof on these boxes makes them feel safer and more protected than just an open crate. 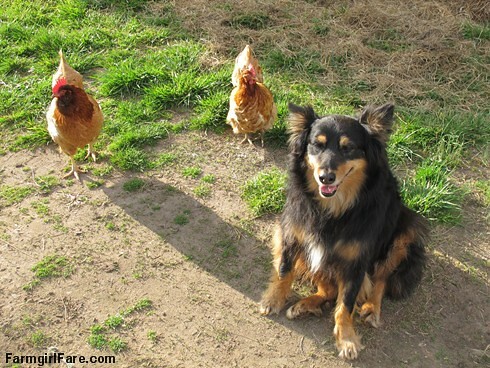 Those chickens are really beautiful - those feathers are gorgeous. And, of course, you know joe much we love your dogs. Hunky Farm Guy is definitely a rock star! Thanks for the photos and the interesting info about the coop. Fractures me every time I say it aloud. Thanks again. I love your little laying boxes! Those would be great to place around the farm at strategic points. I think my man and I may be building some of our own this weekend. Love viewing the pics on your site. Looks very peaceful and relaxing at your farm. I am a country girl at heart, but enjoy the convience of living in the city. Would love to raise sheep or alpaca myself one day. And of course beautiful chickens for fresh eggs. Love your recipes. Tell me which bread recipe is it that the "boys" fight over? Your brother-n-law is my neighbor. Also, which one is referred to as the "crack" cookie recipe? So glad you're enjoying my recipes. Ha, the 'crack' (oatmeal) cookie recipe isn't posted (that one's sort of a family secret ;) but these soft and chewy oatmeal coconut cookies are really good too. The Farmhouse White is our everyday sandwich bread, but I usually make it with at least half whole wheat flour. It's a great recipe for beginning bread bakers and can be adapted in unlimited ways. I just baked the cookies to take to someone at work tomorrow for their birthday. All i can say is UMM-MMM-MMM-mm!! If they get any tastier overnight, they just might not make it to work! Thanks for the recipes.